Eric Maldonado is a young musician and guitar teacher from Simi Valley, California. 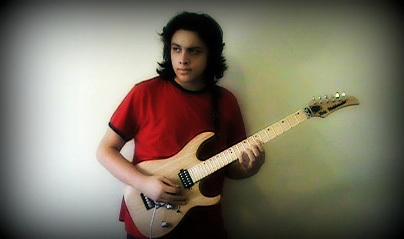 Eric is influenced by guitar players such as George Lynch, Steve Vai, Joe Satriani, Paul Gilbert & John Petrucci. He has been seen by well respected players such as George Lynch, Andy Timmons, Bruce Bouilett & Kiko Loureiro. His new debut album is a mixture of all his influences and features a unique modern approach to instrumental guitar. Eric is also endorsed by DiMarzio Pickups & Accessories, HALO Guitars, Morley Pedals, AWE-In-One picks, Guitar Pro 6, AMT Electronics USA and is signed to Elusive Sound Entertainment Records. "Wow! The G2M is probably the coolest piece of midi gear I own. What you are able to do with it is just unbelievable. Your creativity is infinite. It is like having a midi pickup without having to actually install one on your guitar. I use it to program instruments in my songs, play virtual instruments(VSTi) & tab out lessons. This little device does it all. These guys really know what they are doing!"